Very rarely, a parody will rise above its rip-off origins to become something better. The Teenage Mutant Ninja Turtles, for instance, were originally just a riff on the most popular books of the day. Cervantes' Don Quixote is actually poking fun at Adamis of Gaul, a 16th-century tale that's all but forgotten today. More young people watch The Daily Show and The Colbert Report than CNN and Fox News. And for a brief period in the '90s, Lobo's popularity almost eclipsed Wolverine's. The name "Lobo" means many things - none of them good. Terror, violence, unrelenting pursuit... in Khundian, it means "he who devours your entrails and thoroughly enjoys it". Born on the peaceful, utopic world of Czarnia, Lobo was different. He killed the doctors in the delivery room and continued to cut a bloody swath up through his teen years. His crowning achievement was when he decided he wanted to be unique: in science class, he engineered a tiny flying insect that he released as a plague, killing over five billion other Czarnians - of course, he'd made himself immune. To fulfill his love of violence, Lobo became a bounty hunter - he can track a bounty through the vacuum of space, and once he takes a job, he never gives up until the contract is fulfilled. Originally a Velorpian (rather than Czarnian) bounty hunter, Lobo was introduced in Omega Men #3 in 1983. A spin-off of Green Lantern, Omega Men was a space-faring book, which is why it wasn't odd to run across an alien bounty hunter. The character wasn't a standout, and was in fact fairly forgettable - until Kieth Giffen completely revamped the character in the '90s, turning him into an indictment of the badass hero prototype. For whatever reason, the "bastich" version caught on, and Lobo swiftly became one of DC's most popular characters. 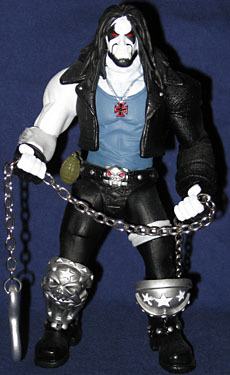 In the late '90s, Lobo appeared on Superman: The Animated Series and there was going to be an exclusive animated-style Lobo figure at the Warner Brothers Studio Stores, but that never came to fruition. On October 17, 2001, however, DC Direct released the Main Man in a deluxe box set with his bike and his dog. Lobo is 6¾" tall, and moves at the knees, thighs, hips (pseudo-balljoints, surprisingly), wrists, elbows, shoulders and neck. The sculpt has a nice amount of detail, even for a figure that's five years old. 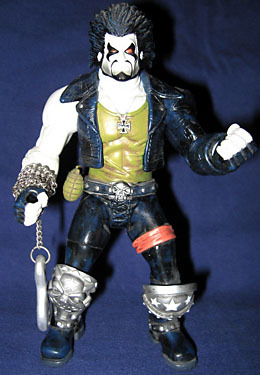 These days Lobo is wearing more piratey clothes, but this figure depicts his classic "Hell's Angel" look. There are two grenades on his belt, but they're not removable - if you want a weapon, he comes with his hook and a real metal chain. Of course, he can't actually hold the chain, since his hands aren't designed for it. The best you can do is wrap it around his forearm. Yes, that's the way he carried it in the comics: it just would have been nice if you could put it in his hand, too. The figure's face is good, but his head is weird. For some reason, they gave him the sort of big, poofy hairdo that he used to have in his Omega Men days. You could pretend it's supposed to be blowing backward as he rides his bike, but he's a biker in space - no air. It looks like he stuck his finger in a light socket. Bad choice, DCD. The expression is appropriately angry, with deep furrowed brow and a big grimace on his lips. The edges of his facial stigma are all sculpted in, and he's got a bit of stubble. Yes, the paint is good. His leather has a slight blue tint, and there's a bit of hair on his exposed right forearm. His tanktop is almost the same color as his grenades, and there's an orange bandana tied around his left thigh. His skin is chalky white (which makes it damn hard to photograph) and his eyes are bright red. Lobo's bike had to be toned down a bit to fit in the box and to keep the price reasonable, but it's still pretty boss. It's about 8" long, and does a good job of capturing the look of the comics. There's a skull on the front, three big technological engines and a high-backed seat. 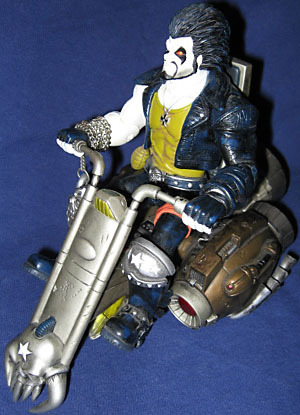 The handlebars move so you can get them in Lobo's hands, and there's an instrument panel between the rider's legs. They even included a headlight! There are no pegs or anything to keep the figure in place - he just sits on the bike and holds the handlebars - but once he's on there, he's gonna stay. 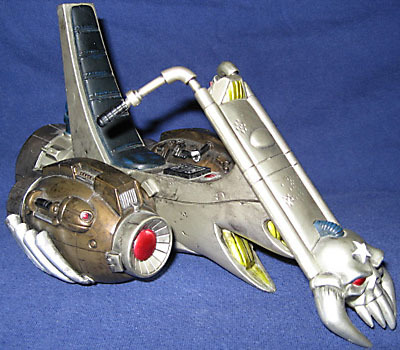 There's one other accessory in the set, Lobo's dog Dawg. Dawg is an ugly little bulldogall hunched over and angry-looking. He's white, with a wash to bring out the surprising details, and a black, spiked collar. He only moves at the head, but that's enough. An accessory that would have been really nice, though? A space dolphin - they're the only creatures that Lobo loves, and he'll defend them from all harm. In fact, in 52, he's a high priest of their church. He loves his fishies, and they love him back! Since not many people got a chance to own Lobo and it's been several years since he was released, he was included in the initial series of the DC Direct ReActivated line, a line which offers old figures to new fans. ReActivated Lobo features several differences, most noteably the head. Instead of a poofy, wind-swept afro, he's got dirty, stringy biker hair. Rugged! The face is an all-new sculpt, with a malicious grin. The "beard" is too thick on his chin, though; he has those markings that look like a moustache, but he's not supposed to have a full beard. The hook accessory has gotten changed, too, so no one tries to put this chain with the old figure and call it complete. The original had a thin chain with wavy links; the new one has a thick chain with oval links. His leathers are black, and his shirt is blue instead of olive. The skin's still white, but the hair on his arm is darker. Because his hands are open, he can ride on the bike just like his progenitor. However, that also means he's sort of squatting - the "bike riding" pose from the original makes less sense in this case. 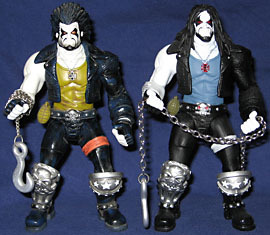 Even if you have the original Lobo, it's worth it to pick up the ReActivated version: there have been Marvel Legends variants with less changes than this and, unlike some characters, having two Lobos makes sense; one of the Main Man's original powers (until his boss tricked him out of it) was that every drop of his blood would grow into a complete adult clone of him. So, two Lobos? That's fine. If you were a DC reader in the '90s, the odds are that you have at least a passing familiarity with Lobo. He may not be your favorite character, but you can't deny that a lot of people like him, and since he's met so many different characters, he can fit into pretty much any display. If you can find the original, go for it - you can't beat that bike. But if all you can find is the ReActivated, give him a look. What's your favorite successful parody? Tell us on our message board, The Loafing Lounge.